S&P 500 index gained 1.3% on Wednesday, following lower opening of the trading session. The market has extended its rally from Friday's low. But will it continue higher today? 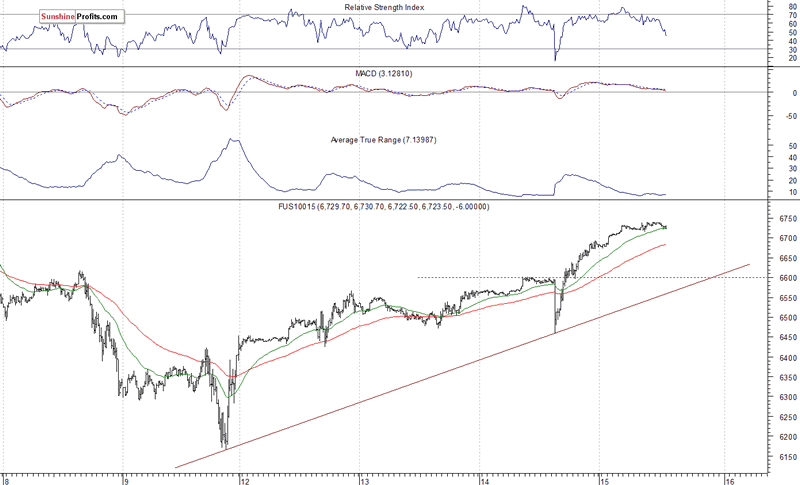 We can see some short-term overbought conditions. Was this two-week-long sell-off the beginning of a new medium-term downtrend or just downward correction before another leg up? It's hard to say, but this move down set the negative tone for weeks or months to come. The U.S. stock market extended its short-term uptrend on Wednesday. The main indexes gained 1.0-1.9% following lower opening of the trading session. The S&P 500 index broke above its Monday-Tuesday trading range. The broad stock market gauge retraced most of its last week's Wednesday-Friday's sell-off, as it got close to 2,700 mark again. The Dow Jones Industrial Average gained 1.0%, and the technology Nasdaq Composite gained 1.9% yesterday. The nearest important level of resistance of the S&P 500 index is now at 2,720-2,730, marked by last week's Wednesday's local high of 2,727.67. The next resistance level is at 2,740-2,760, among others. On the other hand, support level is at 2,640-2,650, marked by some recent local lows. 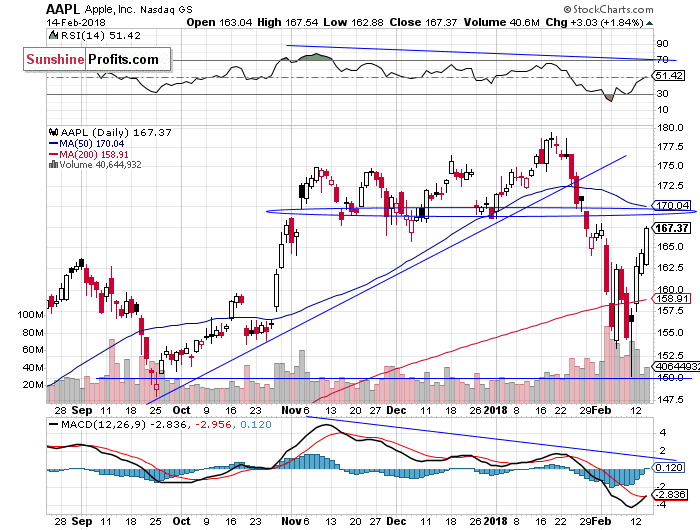 The next level of support remains at 2,580-2,600, among others. The S&P 500 index is very close to the 50% retracement of the sell-off from record high of 2,872.87 (2702.78). The next important retracement of 61.8% is at 2,742.92. The index futures contracts trade 0.5-0.9% higher vs. their Wednesday's closing prices right now. It means that investors' expectations ahead of the opening of today's trading session are positive. The European stock market indexes have gained 0.5-1.4% so far. But will the sentiment remained that bullish after cash market opening at 9:30 a.m.? 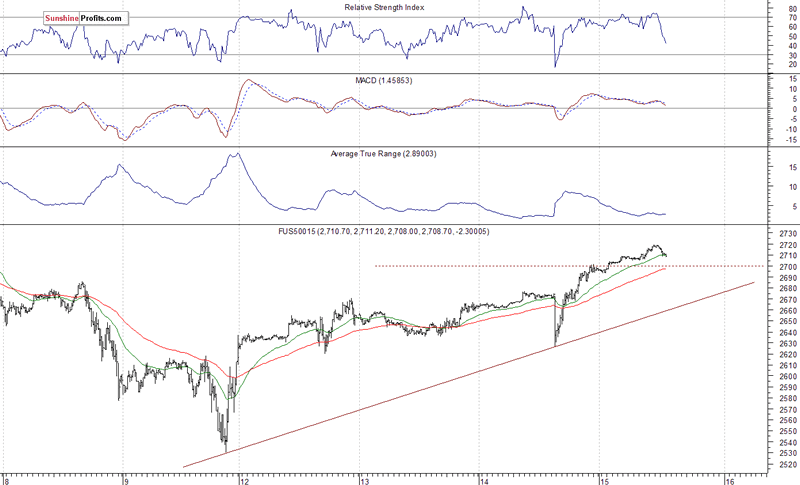 For now, it looks like the market may extend its short-term uptrend and continue its run above 2,700 mark. It may retrace the whole Wednesday-Friday's sell-off. Investors will wait for series of economic data announcements today: Producer Price Index, Empire State Manufacturing Index, Philadelphia Fed Manufacturing Index, Initial Claims at 8:30 a.m., Industrial Production, Capacity Utilization at 9:15 a.m., NAHB Housing Market Index at 10:00 a.m. Investors will also wait for more quarterly corporate earnings releases. The Dow Jones Industrial Average daily chart shows that blue-chip index broke below its short-term consolidation more than two weeks ago on Friday. The price sharply accelerated its downtrend on Monday, as it broke below the level of 25,500 and continued towards 24,000 mark. There were some medium-term negative technical divergences - the most common divergences are between asset’s price and some indicator based on it (for instance the index and RSI based on the index). In this case, the divergence occurs when price forms a higher high and the indicator forms a lower high. It shows us that even though price reaches new highs, the fuel for the uptrend starts running low. Concluding, the S&P 500 index broke above its short-term consolidation yesterday, as it extended its rally from Friday's local low of 2,532.69. The market reached 50% retracement of its move down from January 26 all-time high at 2,872.87. But will it continue higher? It may open higher, but we will probably see some short-term uncertainty and profit taking. 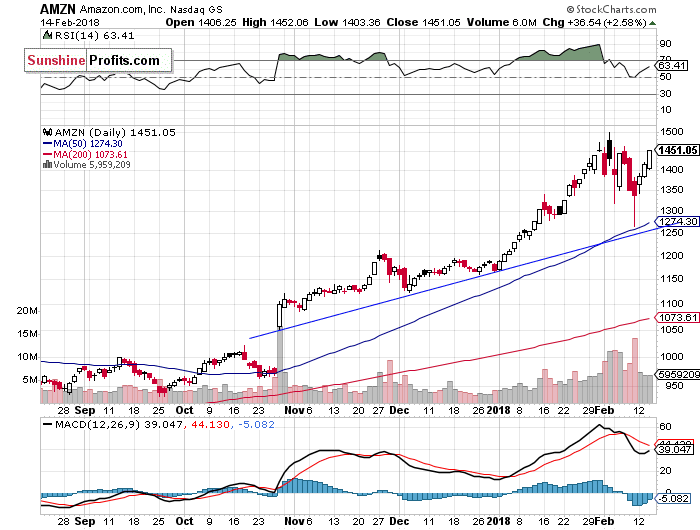 The broad stock market was retracing almost 12% off its late January record high on Friday, before an intraday reversal. Was this some final panic selling ahead of major upward reversal? Tuesday-Wednesday's rally was just "dead cat bouncing" upward correction. 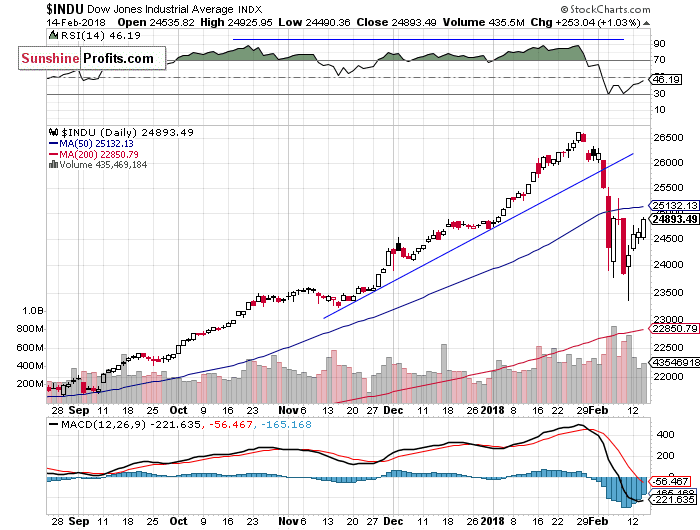 On Friday, we wrote that the market may find some short-term support at around its medium-term upward trend line, which was at 2,550. 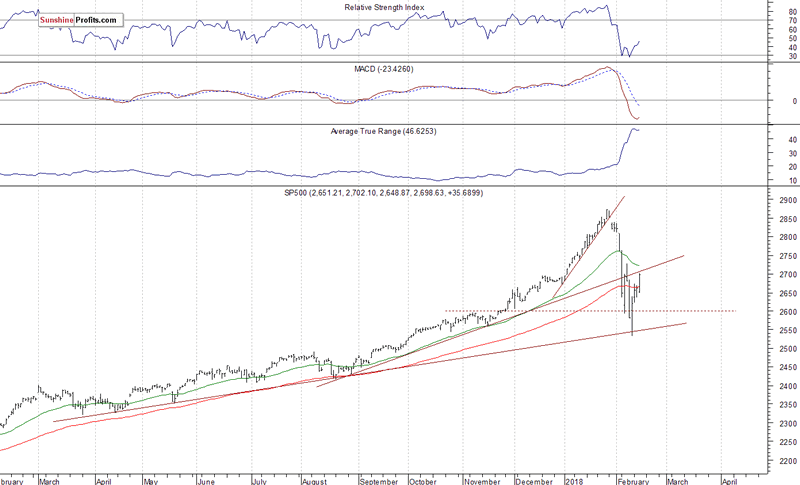 It came true, as the index bounced off support along the level of 2,530-2,550. The market extends the rebound from Friday's low, but it is still below its last Wednesday's local high. The S&P 500 index traded around 7.5% above its December 29 yearly closing price on Friday January 26. This almost month-long rally seemed unprecedented. The legendary investor John Templeton once said that "bull markets are born on pessimism, grow on skepticism, mature on optimism and die on euphoria”. So, now it looks like it was an euphoria phase of the nine-year-long bull market. Did it die over a week ago? It's hard to say, but new record highs scenario seems unlikely now.